There are too many people that give up when they are diagnosed with a chronic disease. It seems like the very word “chronic” tends to make people feel as though there is nothing they can do, nothing they can change to reverse, stop, or even slow the process of chronic disease. Just the word insin uates hopelessness, so what is the point of even trying, right? “Chronic disease” are words that no one wants to hear, and there is no doubt that being diagnosed with a chronic disease is a life changing situation. There is absolutely no reason to give up, though. Instead, try to use your diagnosis as a new lease on life. Take this new information for what it is: a warning call from your body to make some changes. It is time to make some dietary adjustments to your lifestyle. This includes keeping regular doctor’s visits, being vigilant with monitoring your health markers, incorporating physical exercise into your routine, and making dietary adjustments that are appropriate for your condition. When chronic disease strikes, don’t give up, strike back by being as healthy as possible. Many chronic diseases can be helped, and their progress significantly slowed or even halted, with dietary adjustments. Renal disease, for example, is a chronic illness that can be significantly affected, to the point where the progression of the disease can be stopped, simply by the foods that you eat. 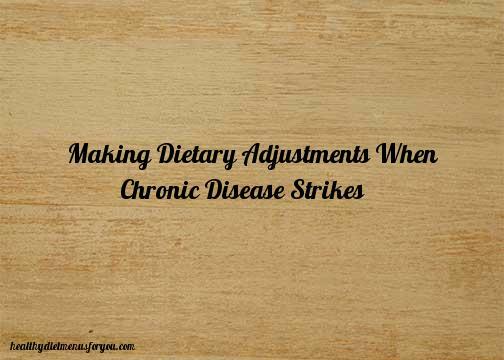 Making dietary adjustments can also significantly relieve so many symptoms of multiple chronic diseases, like pain and dizziness. All of this good simply by eating right sounds too good to be true, but it truly is that easy. Every bite of food and sip of beverage that goes into your body affects your body as a whole. The particles are broken down by your body, and the nutrients and byproducts are processed through all of the systems in your body. For this reason, it is important to watch what you eat, especially if you have a chronic disease. Focus on whole grains and plenty of fresh produce. Clean out your pantry and remove all of the junk food and processed foods. If you don’t have them in the house, you will be more likely to eat the good, healthy foods you replace the bad ones with. Starting new eating habits can be a shock to your system at first. Do whatever you can to stick with the program for a couple of weeks and you will start to build new habits. You will also start to notice all the benefits of your new, healthier diet. Of course, before you begin any new diet or lifestyle changes, you should speak to your physician. Your doctor will give you ideas on what foods to avoid and what to look for as you start your new lease on life with these dietary adjustments. For other ideas you can click here or go to my sister site.